I've got craft ideas for you today! Yippee! 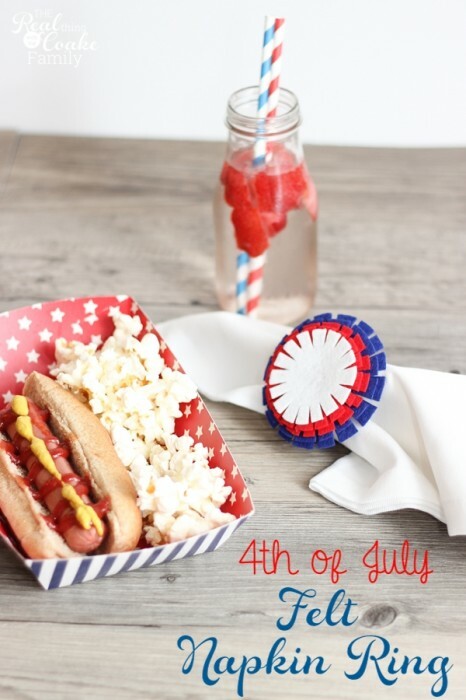 This is a fun 4th of July craft that is easy to make. It will take you a little bit of time, but it is not hard at all. This is yet another idea I borrowed from my walk through Crate & Barrel. It sure was fun to see all their ideas and come up with a few blog posts for 4th of July. I found the 4th of July Pretzels and the 4th of July Mason Jar Oatmeal cookie ideas on the same trip through the store. Thanks Crate & Barrel! 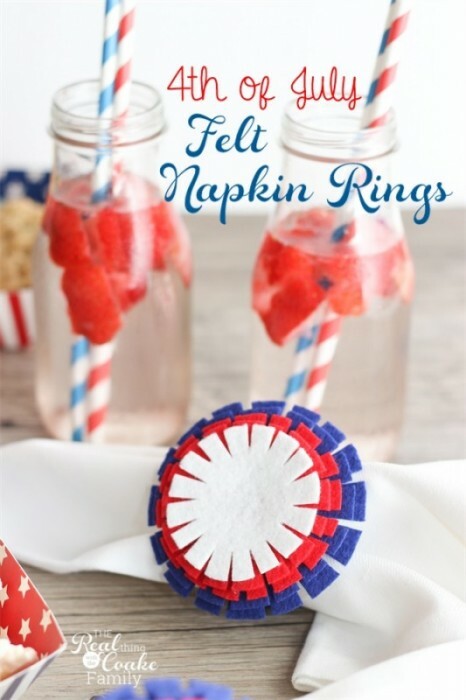 Today, I want to show you these super simple to make felt napkin rings that are perfect for the 4th of July. If you'd rather buy them, you can. 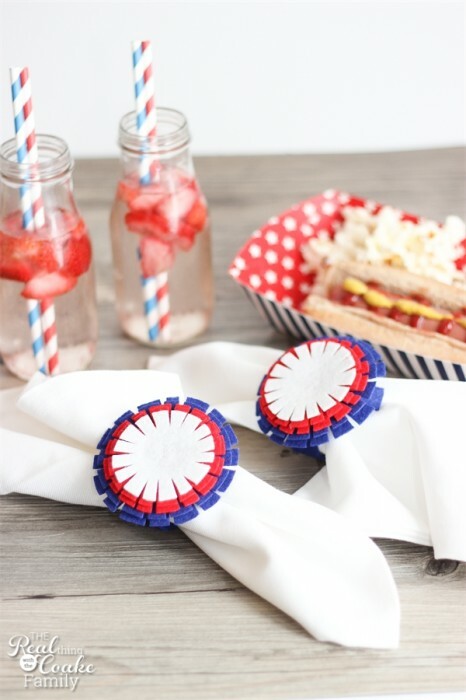 They are $2.95 each: Fireworks Napkin Ring. I made myself a handy-dandy template or pattern to make cutting these out simple, quick and uniform. You can download your template here: craft ideas. For each napkin ring you would like to make, cut one of each size in the pattern. I was making 4, so I cut out 4 of each size and shape. Align your circular pieces on top of each other, so you can make sure they work together and don't need some small trimming. Also, if you cut your blue (or red) circles at the same time, when you cut the slivers off in the steps below, they will line up and will look better. 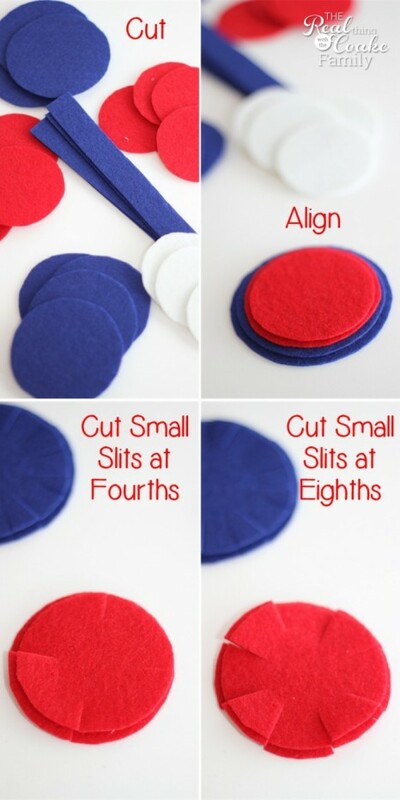 To make the cuts, start by cutting the circle in fourths using small slits, not cutting all the way through. Next, go back and cut a small slit in between each of your original four cuts. This would be cutting in eighths. Once again go back and cut a small slit in-between each of the last small slits you made. This is cutting the sixteenths. Layer your now cut circles. 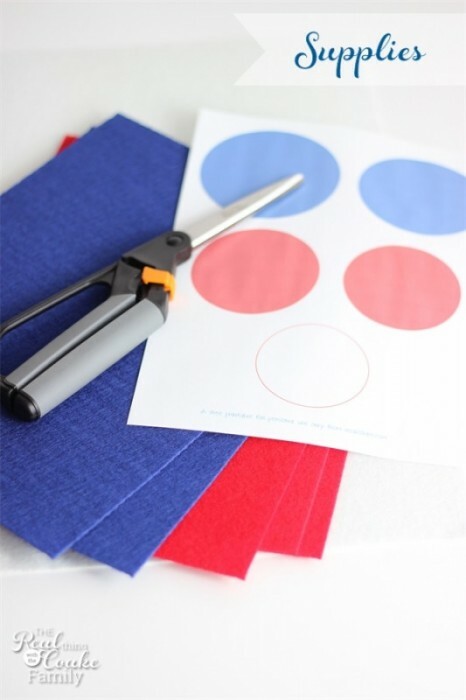 If you cut your blue or red layers at the same time in the first step, they should line up and look about the same. Use a thin layer of hot glue to glue the layers together. Take the rectangular strip that you cut out from the pattern and glue the ends overlapping with the hot glue. 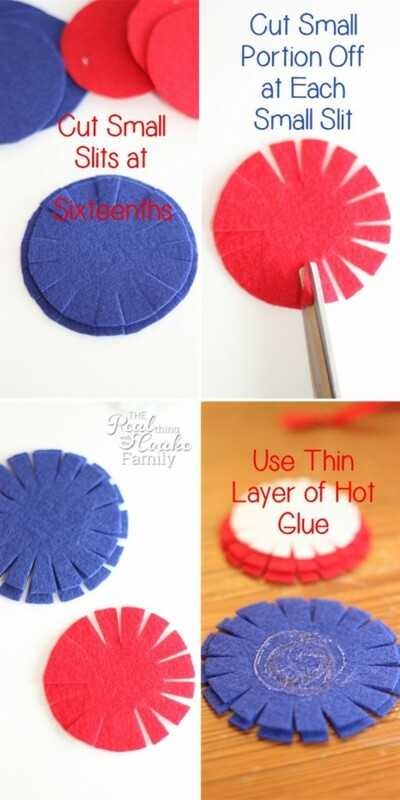 Glue your firework (I think it looks more like a flower, but whatever) to the circular piece of felt you just glued. It will look best if you glue the firework to the part you just glued that is overlapping. That way the part with no seam will be what is noticeable when a napkin is placed in the napkin ring. You are already done! See, I told you that was easy. I get a little bit impatient, so the cutting of everything along with cutting the slits pushed my patience level. I would have done better had I turned on a TV show and settled into do the cutting. As it was, I was running on a deadline to get this done for this post….so I was a bit impatient. Bet that never happens to you, right? 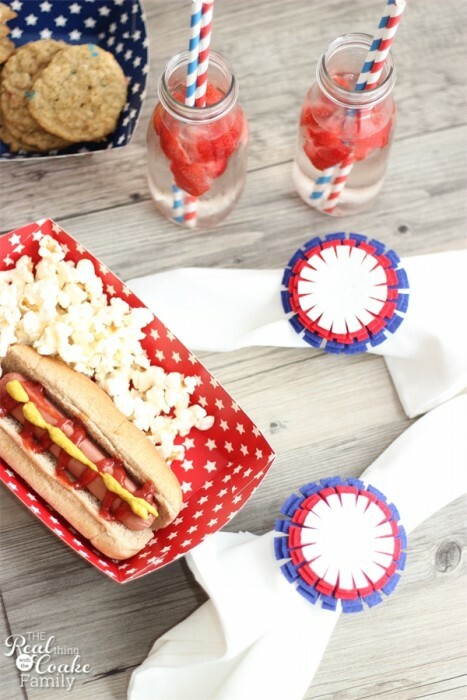 Perfect accompaniment to a 4th of July table and an all American meal! Bonus…they are super cheap to make. Each sheet of felt was $1. So for the amount I needed to make 4 napkin rings, it was $4. Perfect! What do you think? Buy them or make them? Cost difference is $8. So cute!!! Thanks for the idea! I have to ask where you got the stars & stripes paper boats for serving food??? LOVE them!!! Thank you! They were so easy, I have a feeling I will come up with other idea for future holidays. 😉 Great idea to use them for your next party! Enjoy! Thank you! I can give credit for the idea to Crate & Barrel, I merely executed the idea for a lot cheaper. Enjoy! These are just adorable! Looks like I need to check out my Crate and Barrel! Thanks, Jessa! Crate & Barrel had a bunch of cute 4th of July things! Have fun! KC, this looks amazing. You always do such a wonderful projects. 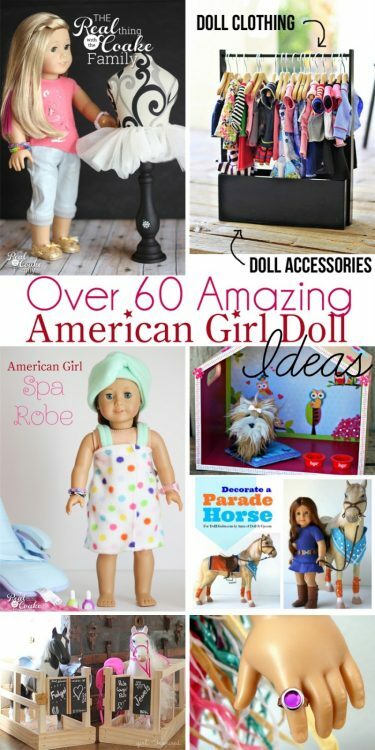 I just love your blog and all your creative ideas!! These are cute. Thanks for sharing. Hello from the Creative Collection Link Party! Thanks! You are welcome. Hope you enjoy! 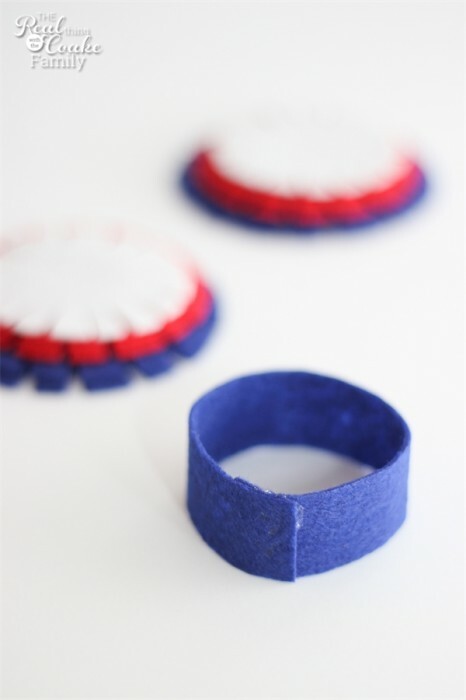 Love these napkin rings, and they could be great for so many occassions just made with different color combos. thanks for sharing on craft schooling sunday! Thank you! You are right, they would be great for many occasions. I have thought of making more, but never seem to get around to it. Thanks for hosting! Such a cute and easy idea. Putting all the materials on my list to buy. Thanks for the project. Thank you! It sure is easy and they are so cute. Have fun! I’d love to see yours if you make them. Fun! 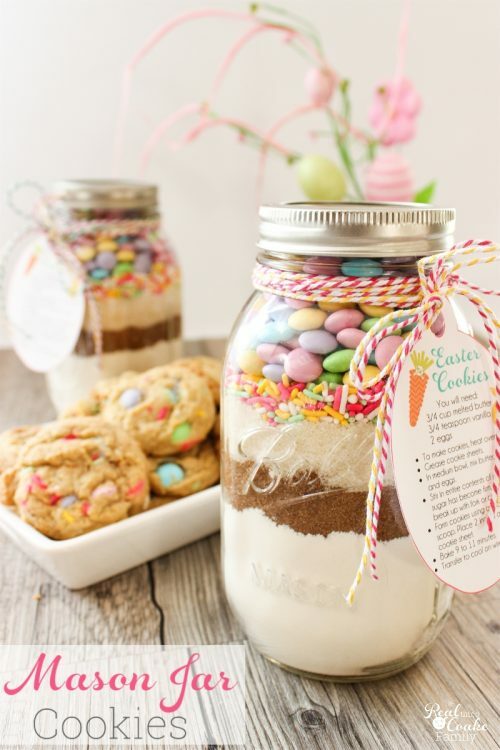 Very cute DIY! Thanks for sharing with us at Throwback Thursday. Pinned and shared! Can’t wait to see what you bring to the party this week. These are really cute! They kind of remind me of the old fashioned rosettes on old timey banners! Thanks for joining us again at Throwback Thursday! !